Mole End at Barnacre Cottages in Scorton, near Garstang sleeps 7 people. Located in the heart of Lancashire’s beautiful countryside, Barnacre Cottages were the first self-catering cottages in Lancashire to be awarded Visit England’s 5 Star Gold Award, and have since gone on to achieve many other regional and national awards. They have been created from old stone buildings of an 18th century farmhouse that had lain empty and neglected for many years, and have now been converted by the owners into beautiful holiday cottages. Situated at the top of the field, Mole End (31222) is a spacious, detached, stone-built holiday cottage with spectacular views over the surrounding Lancashire countryside. With accommodation for 7 guests, it is ideal for small groups or families. Sleeping 6, ref 31221 [Partridge Cottage] is a mid-terraced cottage offering attractively presented and comfortable accommodation, ideal for families and couples. Thanks to its proximity to the M6, Blackpool and Lancaster are very easily accessible, as are the Yorkshire Dales, Ribble Valley, Cumbria and the Lake District. Situated in the Forest of Bowland, designated an Area of Outstanding Natural Beauty, Barnacre Cottages are ideal for those who enjoy walking and outdoor activities. There are many footpaths and lanes to follow, including the popular Nicky Nook and Grizedale Valley walks, that follow the river through the valleys and up to the reservoirs. With wildlife in abundance, walking here is a pleasure. Take a break along the way at the nearby village of Scorton, with its café, coffee shop and pub. The popular market town of Garstang, 4 miles, offers a variety of individual shops and a weekly market every Thursday. A wider range of amenities can be found in the historic city of Lancaster, 12 miles, whose attractions include the castle, museum, Tropical Butterfly House, Dukes Theatre and Williamson Park, which hosts various events and plays throughout the summer. Further afield, a 45-minute drive will take you to Kendal in the Lake District. Windermere, Bowness and Ullswater possess attractions ranging from the World of Beatrix Potter, to a steam train ride at Ravenglass. For those who prefer a coastal landscape, the beautiful Fylde Coast is easily accessible from Barnacre. Blackpool, 15 miles, has many attractions for people of all ages including The Pleasure Beach, with its 235ft high Pepsi Max roller coaster, Blackpool Zoo, Sea Life Centre, Madame Tussauds, The Illuminations, which are held each autumn and the famous Blackpool Tower. Enjoy a donkey ride on Blackpool’s award-winning beaches. Other coastal towns include Thornton Cleveleys and the cosmopolitan Lytham St Annes, which has a good selection of bars and restaurants. 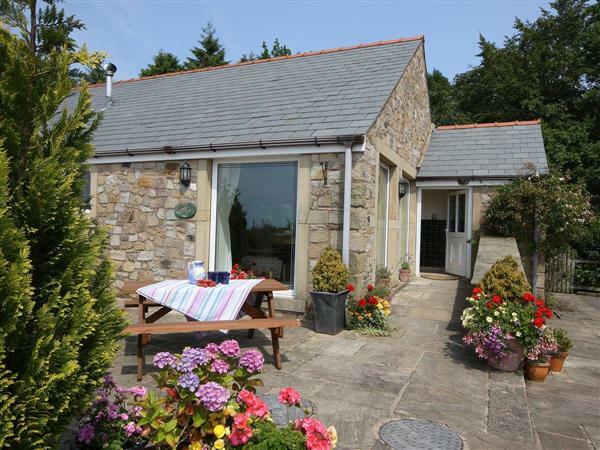 The cottages are ideally situated with lots to see and do right on the doorstep. The shop and restaurant are 2 miles from Barnacre Cottages in Scorton; with the pub 1½ miles. Ground floor: Living/dining room/kitchen with tiled floor. 2 double bedrooms, one (5ft) with en-suite bathroom with bath, shower cubicle and toilet, one with additional single and en-suite wet room and toilet. Separate toilet. First floor: 1 twin bedroom (zip and link, can be 6ft double). Underfloor oil central heating and oil included. Oil Aga. Fridge/freezer. Parking (3 cars). Both properties at Barnacre Cottages: Multi-fuel burner in living room included. Electricity, bed linen and towels included. Travel cot and high chair on request. 32 Satellite TV. DVD. Microwave. Washing machine. Tumble dryer. Dishwasher. Wi-Fi. Enclosed garden with patio, sitting-out area and furniture. Shared 14-acre grounds. Barbecue on request. Shared tennis court. Children’s play area. Cycle store. No smoking. Holidays at Mole End, Barnacre Cottages in Scorton run from Friday to Friday. Visit England 5* Gold Award. For a better idea of where Barnacre Cottages - Mole End is, you can see Barnacre Cottages - Mole End on the map below. Barnacre Cottages - Mole End is in Lancashire; should you be on the lookout for a special offer, you can find all the special offers in Lancashire. It's always worth checking to see what is on offer at the moment. Do you want to holiday near Barnacre Cottages - Mole End (31222), you can see other cottages within 25 miles of Barnacre Cottages - Mole End; have a look to find your perfect holiday location.